This carved stone was purchased by the L'Anguille Chapter of the Daughters of the American Revolution and placed here in the middle of this forty-acre swamp way back in 1926. This stone marks the Point of Origin, or Initial Point, which had been lost until 1921. The Point was first found in 1815 by two surveyors, Prospect Robbins and Joseph Brown, who had been hired by then-president Thomas Jefferson to find this point. The whole point of finding this point is to have a single standard point to which all surveys of the Louisiana Purchase would geographically relate. The position of every official geographical benchmark from the mountains of Montana to the mouth of the Mississippi is geographically fixed by this rock in the middle of this swamp. This rock marks the intersection of the fifth principal meridian and the national baseline. I would have thought that the national baseline and the fifth principal meridians would have some mathematical or geographical significance. I would have thought they might be chosen because they are a longitude and a lattitude with nice round numbers, but that's not the case. The longitude of the fifth principal meridian is a little over 91 degrees west. The lattitude of the national baseline is about 34 1/2 degrees north. Bill Colton of the Arkansas Geographical Commission tells me that the fifth principal meridian was fixed by the confluence of the Arkansas and Mississippi Rivers and that the baseline was fixed by the confluence of the Saint Francis and Mississippi Rivers. The Initial Point is therefore literally a coincidence of lines drawn from these two starting points. That story makes the most sense to me, since those would have been the most convenient landmarks back in 1815. I have also learned from Fred Nielson at the Office of Land Survey that each state has its own baseline, so while the lands of the Louisiana Purchase might once have been fixed to this point, it is true now only hypothetically. And even in 1815, as a matter of convenience a second Initial Point was selected for the surveying of lands way up north. It is the hostility of the location that allows this point to survive in its original condition. This is a rare headwater swamp, so it can't be drained or filled to be made into agricultural land. 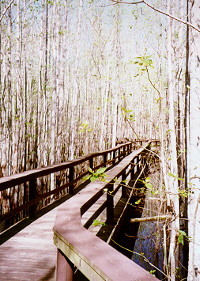 This swamp was designated Louisiana Purchase State Park in 1961. If you want to get to the Point, I recommend doing it in cold weather. 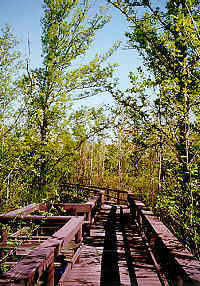 I came here in April, and this boardwalk is swarming with red wasps, yellow jackets and bumblebees. Idly kicking your toe on the wrong board will scramble squadrons of any number of flying, stinging insects. Once you've done that, you can either run down the boardwalk back to the parking lot, kicking up swarms of paper wasps in your wake, or you can hop into the swamp and take your chances with the cottonmouths and copperheads. I'm not kidding about that. Having one's movements restricted to a narrow, wasp-infested boardwalk with a hostile-looking swamp on both sides is really, really unnerving. Staying cool is your only defense, and bumblebees have this territorial habit by which they challenge anything that comes too close. All they do is hover about a foot in front of you and block your path. You can shoo them away with a few waves your hand, but hope that you don't accidentally hit one while you're doing it. Then consider the boardwalk is a quarter mile long and you'll be crossing the territories of maybe a hundred bumblebees on the way in and again on the way out. It's a very long quarter-mile. While I was there, a state employee, one who had done some construction on the boardwalk, came to check on his handiwork. I mentioned to him that there were only three or four parking places at the head of the boardwalk, and that this must be the least-visited State Park in Arkansas. He told me that I was the only visitor he had ever seen here. To get to the point, take US 49 south from Brinkley and look for the brown "state park" sign.